The KETTLER Unix M elliptical trainer provides exceptionally smooth performance with its massive 40 pound flywheel drive system. The high resolution LCD computer display provides workout data including Time, Distance, Heart Rate, RPM and Energy Consumption. The computer also calculates the percentage of one's maximum heart rate and alerts with high or low indicators if the pulse rate reading is out of the ideal zone. Heart rate readings are measured with an infrared heart rate earlobe clip sensor or by holding the telemetric hand grips. Regular use of the Recovery feature will provide grading of one's cardio wellness which can be highly motivating by showing improvement over time. The Unix M was designed, engineered and manufactured by KETTLER in Germany to assure the highest quality and reliability. 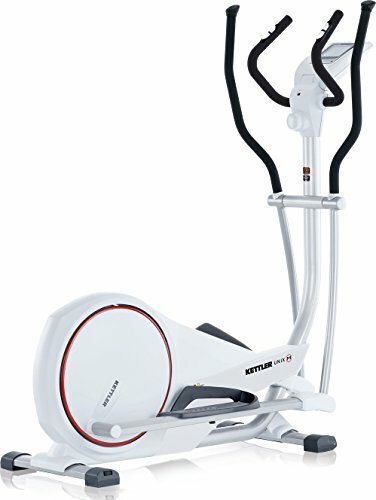 The KETTLER Unix M elliptical trainer is an excellent choice for those seeking intuitive operation, challenging workouts and excellent performance.